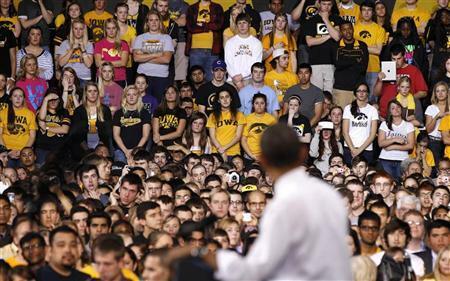 U.S. President Barack Obama talks about the rising costs of student loans while at the University of Iowa in Iowa City, April 25, 2012. You have probably mentally cataloged the student loan crisis alongside all the other looming trillion-dollar crises busy imperiling civilization but also enrich the already rich. But it is different from those crises in a few significant ways, starting with the fact that the entire loan business is arguably unconstitutional. You don't have to take it from me: A pre-eminent bankruptcy scholar made precisely this argument under oath before Congress. In December 1975, when Congress was debating the first law that made student loans non-dischargeable in bankruptcy, University of Connecticut law professor Philip Shuchman testified that students: "should not be singled out for special and discriminatory treatment. I have the further very literal feeling that this is almost a denial of their right to equal protection of the laws … Nor do I think has any evidence been presented that these people, these young people just beginning their years on the whole should be singled out for special and as I view it discriminatory treatment. I suggest to you that this may at least in spirit be a denial of their right to equal protection with the virtual pole star of our constitutional ambit." The thing is, though, discrimination was kind of the whole idea. Stagflation was sending an unprecedented number of Silent Majority members into bankruptcy, and the bank lobby was fighting back with a propaganda assault that scapegoated counterculture student delinquents who were allegedly taking loans with no goal of paying them. As Shuchman and others explained in hearings, only about 4 percent of people who filed for bankruptcy protection in 1975 had student loans on their balance sheets, and of those, fewer than one-fifth did not have substantial other debts motivating them to file. But try telling that to anyone who'd been reading the papers! A typical syndicated dispatch on the surge in student deadbeats was the August 27, 1972 exposé by Los Angeles Times reporter Linda Mathews, which began with the personal anecdote of an anonymous "Washington banker" who purported to have once "handed a $1,500 check" for the year's tuition to a nameless "18-year-old college freshman" only to be insouciantly told, "Oh, I never intend to repay this loan." The anonymous banker -who had since joined "the staff of the American Banking sic Association" - helpfully explained to Mathews that the kid was, "acting on advice in underground newspapers urging students to use bankruptcy to avoid paying loans." "Elitist cheaters" and "professional deadbeats" had driven default rates "as high as 40 percent in some cases," the Chicago Tribune claimed. "Sometimes when I see someone come out before me with a job and no other debt but a college loan - and not even a big one at that - I feel like saying, 'Why you little stinker,'" a judge told the New York Times. A Wall Street Journal editorial on "the educational subculture" blamed the "crisis" on "an attitude of unconcern" apparently widespread throughout the entire education establishment - "that default really isn't like ripping off anybody, just the large, impersonal government that wastes plenty of money on other things". But to the credit of Congress in that era, the majority of its members were still capable of distinguishing between PR and reality. It concluded its round of hearings in February 1976 by postponing the vote on the non-dischargeability amendment pending a formal Government Accounting Office study on the matter, which in turn confirmed earlier findings that deliberate student deadbeats accounted for a virtually infinitesimal proportion of bankruptcies. In the meantime, mainstream journalists who spent more time in reality than their trend-setting contemporaries uncovered some troubling (and real) trends while scouring bankruptcy filings. Of the small population of twentysomethings who did seek to use bankruptcy protection primarily to discharge student loans, many had been defrauded by fly-by-night "correspondence schools" that had forged the students' signatures and saddled them with staggering loans. They hadn't even known about them until they started getting hounded by collection agencies. By 1977 even the American Bankers Association had joined the conference of bankruptcy judges in lobbying - formally, anyway - against the cruel and unusual punishment of making student debt non-dischargeable. As James O'Harra, the congressman who had commissioned the GAO study, pointed out in his testimony, to enact such a law would be tantamount to "treating students, all students, as though they were suspected frauds and felons" while according arbitrary second-class creditor status to "the grocery store, the tailor or the doctor to whom the same student may also owe money." In 1978 the House of Representatives voted to pass a bankruptcy reform bill that specifically restored student loans to their original status as equivalent to any other form of unsecured debt. But then, in 1978, the bill went to conference committee with the Senate, and the clause came back. Like the loans themselves, it could not be gotten rid of. At first this provision applied only during the first five years of the life of the loan; then it was seven, then eternity. Until 2005 it only applied to federally guaranteed loans; now, thanks to the Bankruptcy Abuse Prevention and Consumer Protection Act, it applies to all. And as the loans became more steadily impervious to the usual laws of credit and debt, they became bigger and more profitable. In the years since the Bankruptcy Reform Act passed in 1978, the nominal price of college tuition has risen more than 900 percent. Over the same period the median male income - again, nominally - has risen 165 percent. And since the percentage of the workforce boasting a bachelor's degree has expanded from less than 20 percent to nearly a third, I don't have to convince you that the median de facto return on investment on those diplomas has diminished greatly over the same years. Which brings us to the second way in which the student debt bubble differs from all the others you've seen: It is legally impossible to pop. By law it can only grow very fast. The profits in this racket are downright hallucinogenic: A military veteran sharing his story with Occupy Student Debt has paid $18,000 on a $2,500 loan, and Sallie Mae claims he still owes $5,000; the husband of a social worker bankrupt and bedridden after a botched surgery tells Student Loan Justice of a $13,000 college loan balance from the 1980s that ballooned to $70,000. A grandmother subsisting on Social Security has her payments garnished to pay off a $20,000 loan balance resulting from a $3,500 loan she took out 10 years ago, before she underwent brain surgery. The human toll exacted by this immortal, justice-resistant debt fills websites and Student Loan Justice founder Alan Collinge's horrifying book Student Loan Scam: The Most Oppressive Debt In U.S. History-And How We Can Fight Back. And yet I didn't even really know about it - not the brutality and scope of it - until I volunteered to research "fighting back" possibilities for an Occupy Wall Street-affiliated group. Neither did any of the other predatory lending buffs I polled; we'd been preoccupied by mortgages, and the government's alarming indifference to the foreclosure epidemic. We weren't ultimately aware of the student loan crisis because there is no legitimate way of fighting back. Under the current regime, the most effective means of sticking it to the proverbial man would in theory be for all students to simply pay off all their debts at once. But even if they could scrounge together a trillion dollars out of their collective couches just like that, there is little doubt in my mind that Sallie Mae and its student-loan-sharking brethren would simply see it as an opportunity to levy a massive prepayment penalty. The Internet is a rich trove of surreal personal accounts of being penalized for overpaying student loan bills. But no one notices, because student borrowers are so utterly powerless. They can borrow a trillion dollars and still pose no threat to the immediate solvency of the financial system. Naturally, this story has its brighter side, with enterprising corporate leadership generating shareholder value. The finances of Sallie Mae, the former government sponsored enterprise formally called SLM Corp, are a bit difficult to divine, but the operating profit margin is over 50 percent. It will surely surge higher if CEO Albert Lord executes on his current strategy of turning the $700 million "sweet spot" that is its "fee income" division into a billion-dollar business. "Fee income" means collections, but student loan collectors "do things that no other industry could get away with," a veteran debt collector named Joseph Leal told Student Loan Justice. They stalk, threaten family members, and jack up loan balances by thousands of dollars at whim, and they do it all with impunity, because they are legally entitled to garnish your wages. The margins on college-loan-sharking are so grotesquely fat that the government even rakes in a juicy cut: In 2010 the Department of Education reported collecting $1.22 for every dollar in defaulted student loans it had guaranteed - and that's after the sharks and their shareholders and the obligatory outright fraud had taken their first round of cuts. Between a quarter and a third of about $850 billion worth of federally guaranteed loans are already in default, so this is real money we are talking about. Given the $23 trillion worth of other securities the federal government has pledged to guarantee over the past few years, we can only expect the default rate to surge higher. Maybe the student-loan-shark hustle was too fishy even for Wall Street, even in 2007, to want to get too close to the action. And if Lord has been spreading the no-risk wealth around Wall Street in the aftermath of the credit crisis, it is not apparent from securitization volume, which has slowed to a trickle even as student borrowing keeps setting new records. In 2010 students borrowed $100 billion, but Student Loan Asset Backed Securities (SLABS) issuance was a meager $13.6 billion, down from a peak of $78.7 billion in 2006. Perhaps this lack of Wall Street skin in the game is partially responsible for the fact that such reliable business lobby organs as Forbes have demonstrated refreshing equanimity to the cause of restoring students' financial rights. The student loan shark bubble will, after all, ultimately prove far worse for business than the subprime mortgage bubble. But it also demonstrates that the shadowy ruling elite's overwhelming contempt towards its citizenry runs deeper and dates back farther than full time chroniclers of American decline ever believed. Correction: This piece originally misstated that Nelnet, a rival of Sallie Mae, currently owns a fee collections subsidiary.